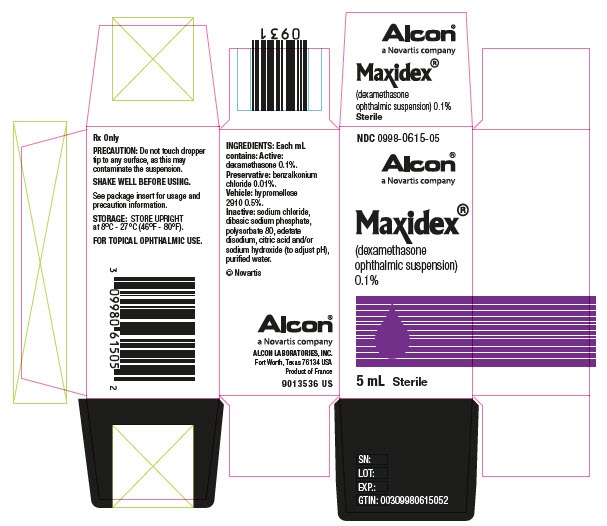 Each mL of MAXIDEX® (dexamethasone ophthalmic suspension) 0.1% contains: Active: dexamethasone 0.1%. Preservative: benzalkonium chloride 0.01%. Vehicle: hypromellose 0.5%. Inactives: sodium chloride, dibasic sodium phosphate, polysorbate 80, edetate disodium, citric acid and/or sodium hydroxide (to adjust pH), purified water. Dexamethasone suppresses the inflammatory response to a variety of agents and it probably delays or slows healing. Steroid responsive inflammatory conditions of the palpebral and bulbar conjunctiva, cornea, and anterior segment of the globe such as allergic conjunctivitis, acne rosacea, superficial punctate keratitis, herpes zoster keratitis, iritis, cyclitis, selected infective conjunctivitides when the inherent hazard of steroid use is accepted to obtain an advisable diminution in edema and inflammation; corneal injury from chemical, radiation, or thermal burns, or penetration of foreign bodies. Contraindicated in acute, untreated bacterial infections; mycobacterial ocular infections; epithelial herpes simplex (dendritic keratitis); vaccinia, varicella, and most other viral diseases of the cornea and conjunctiva; fungal disease of ocular structures; and in those persons who have shown hypersensitivity to any component of this preparation. Prolonged use may result in ocular hypertension and/or glaucoma, with damage to the optic nerve, defects in visual acuity and fields of vision, and posterior subcapsular cataract formation. Prolonged use may suppress the host response and thus increase the hazard of secondary ocular infections. In acute purulent conditions or parasitic infections of the eye, corticosteroids may mask infection or enhance existing infection. In those diseases causing thinning of the cornea or sclera, perforations have been known to occur with the use of topical corticosteroids. If these products are used for 10 days or longer, intraocular pressure (IOP) should be routinely monitored even though it may be difficult in children and uncooperative patients. FOR TOPICAL OPHTHALMIC USE. The possibility of persistent fungal infections of the cornea should be considered after prolonged corticosteroid dosing. Do not touch dropper tip to any surface, as this may contaminate the contents. The preservative in MAXIDEX® (dexamethasone ophthalmic suspension) 0.1%, benzalkonium chloride, may be absorbed by soft contact lenses. MAXIDEX® (dexamethasone ophthalmic suspension) 0.1% should not be administered while wearing soft contact lenses. Long-term animal studies have not been performed to evaluate the carcinogenic potential or the effect on fertility of MAXIDEX® (dexamethasone ophthalmic suspension) 0.1%. MAXIDEX® (dexamethasone ophthalmic suspension) 0.1% should be used during pregnancy only if the potential benefit to the mother justifies the potential risk to the embryo or fetus. There are no adequate or well-controlled studies in pregnant women. However, prolonged or repeated corticoid use during pregnancy has been associated with an increased risk of intra-uterine growth retardation. Infants born of mothers who have received substantial doses of corticosteroids during pregnancy should be observed carefully for signs of hypoadrenalism. 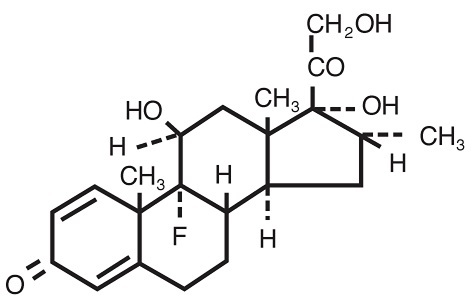 Systemically administered corticosteroids appear in human milk and could suppress growth, interfere with endogenous corticosteroid production, or cause other untoward effects. It is not known whether topical administration of corticosteroids could result in sufficient systemic absorption to produce detectable quantities in human milk. Because many drugs are excreted in human milk, caution should be exercised when MAXIDEX® (dexamethasone ophthalmic suspension) 0.1% is administered to a nursing woman. The safety and effectiveness of MAXIDEX have been established in the pediatric patients. Use of MAXIDEX in all pediatric age groups is supported by evidence from adequate and well-controlled studies of MAXIDEX in adults with safety data from additional adequate and well controlled trials in pediatric patients. Glaucoma with optic nerve damage, visual acuity and field defects; cataract formation; secondary ocular infection following suppression of host response; and perforation of the globe may occur. In clinical studies with MAXIDEX, the most frequently reports adverse reactions were ocular discomfort occurring in approximately 10% of the patients and eye irritation occurring in approximately 1% of the patients. All other adverse reactions from these studies occurred with a frequency less than 1% including keratitis, conjunctivitis, dry eye, photophobia, blurred vision, eye pruritis, foreign body sensation, increased lacrimation, abnormal ocular sensation, eyelid margin crusting, and ocular hyperemia. Additional adverse reactions identified from post-marketing use include corneal erosion, dizziness, eye pain, eyelid ptosis, headache, hypersensitivity reactions, and mydriasis. Frequencies cannot be estimated from the available data. SHAKE WELL BEFORE USING. One or two drops topically in the conjunctival sac(s). In severe disease, drops may be used hourly, being tapered to discontinuation as the inflammation subsides. In mild disease, drops may be used up to four to six times daily. STORAGE: Store upright at 8°C to 27°C (46°F-80°F).